Every now and then I love to go back and re-visit a pairing of horror cinema’s dynamic duo, Peter Cushing and Christopher Lee. This Freddie Francis directed thriller was released through World Film Services as opposed to the duo’s many Hammer productions and those they filmed over at Amicus . Francis worked with both actors in single starring films and had also done their 1965 film together, The Skull. 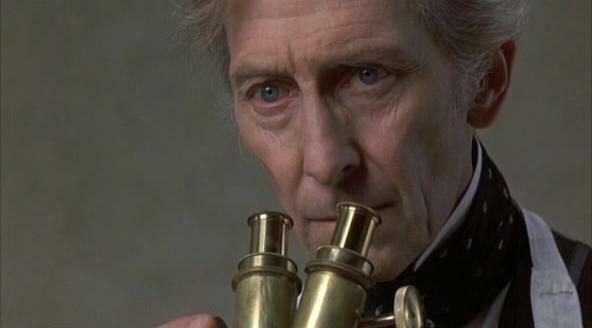 “Do you believe in evil as a living organism?” So asks our well intentioned scientist Peter Cushing who himself believes just that and sets out to prove it. Cushing has just returned from an archaeological dig in New Guinea and has brought back with him an extremely large skeleton. Amazingly when he splashes water on one of the bony fingers, flesh begins to grow back over the bone. This result will of course play an important role later in the film as we the viewer await the inevitable. 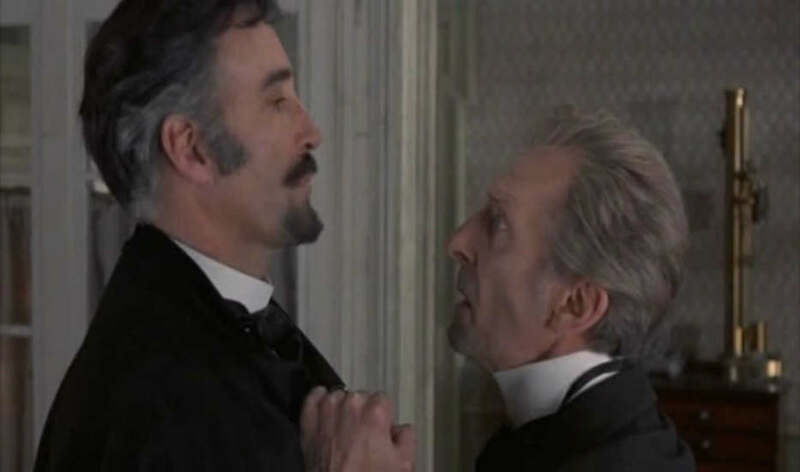 Christopher Lee is playing Peter’s brother who runs the local asylum for the mentally challenged where it turns out Cushing’s wife has been living for years. Lee himself dabbles in similar experiments and hopes to win the coveted Richter prize and the 10,000 pounds that goes with it for his research into the cause of evil within man. Peter has a beautiful daughter played by Lorna Heilborn and this is where I felt the movie went a little off course. She becomes an all too quick excuse for Peter to test his theories and the film goes off in a slightly different direction then I had hoped the first time I saw this and still feel the same way. I would have preferred that the script stick to the skeleton with growing flesh as it’s central theme. On the plus side we do have Lee vs. Cushing here. They are not exactly on friendly terms here and when Lee sees Cushing’s skeletal discovery he has to have it along with Peter’s notes. When ethics are pointed out to Lee, he agrees and promptly arranges for someone else to steal it for him. The film is fun at times due to the teaming of these horror icons yet one wishes the effects had a little bigger budget for the scenes with the ever growing creature. While not a Hammer film, we still get frequent character player from that studio Michael Ripper turning up in a bit here as a freight hauler. 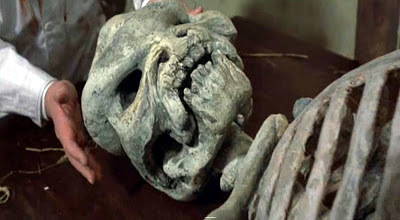 Francis employs his point of view style briefly near the end that he used quite often during the aforementioned, The Skull. Perhaps a nod to that film or just a coincidence? There is a great overhead shot near the climax of Cushing being confronted by the giant. I was also reminded how much Peter’s character at the fadeout looks like his Professor role in At the Earth’s Core from 1976. “Props” Peter has a field day while in his lab with test tubes, magnifying glass and his telescope to keep his character occupied. Then the stern Mr. Lee shows up and the fencing begins. Who will win the coveted Richter prize? Long available on DVD, this recently turned up on blu ray in a three pack from Mill Creek. The other titles being Torture Garden and The Brotherhood of Satan. In other words, it’s money well spent despite this being a lower budgeted label. I haven’t watched this in many years – I do have a copy – so should dig it out. It’s always such a pleasure to see Cushing and Lee together on screen. They are a magical combination when at odds. 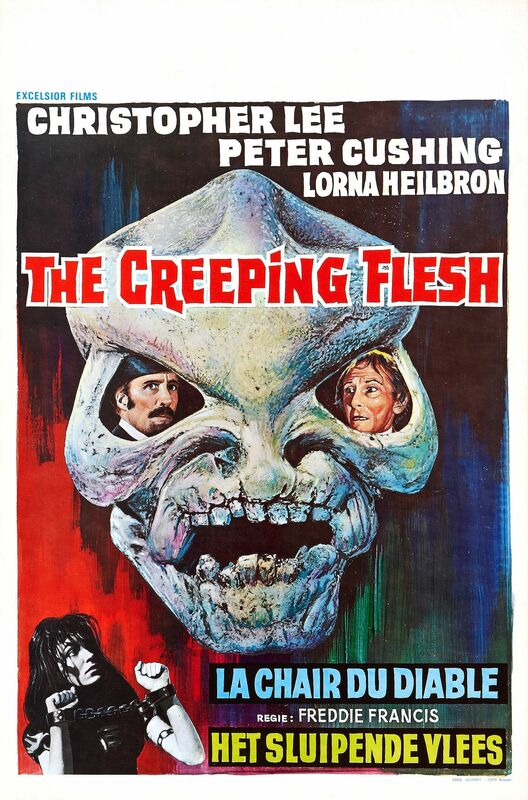 Although flawed, this is something of a unjustly neglected hidden gem with Cushing and Lee superbly at odds. Lorna Heilbronn practically steals the film, which is no east feat. Mill Creek is finally releasing it , along with “Torture Garden” on blu-ray this April. Looking forward to that blu ray release which also has a Strother Martin gem of a thriller, Brotherhood of Satan. Flesh was one of the first films I remember renting on VHS wayyy back when. I was just a kid but knew of the film due to Famous Monsters and other mags that featured the genre.